SEO Projects Move Faster with Botify. Discover How! Botify is the first platform to let SEOs impact each step of the organic search process. Discover how organic search teams use Botify to deliver stronger and faster performances. See how Botify technologies and methodologies help SEO teams move faster and communicate efficiently. Uncover deep technical truths about your digital assets that translate into higher ROI. Ensure organic success by optimizing the content quality indicators like a search engine. Define a content strategy based on search trending and real searcher behavior. Make your SEO channel even more profitable. Unleash surging organic growth with Botify. Use Botify to seize the seismic shift and conquer the mobile-first index. Initiate and secure important SEO projects and optimizations with custom reporting. Skyrocket ROI. See the concrete Botify use cases that will boost your bottom line. 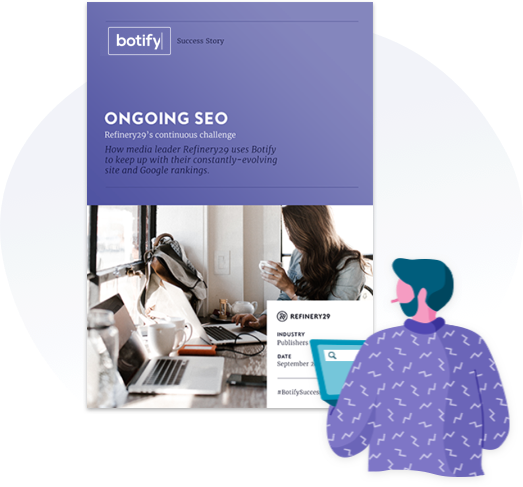 With the help of Botify’s unprecendented SEO insights, Refinery29 proactively optimized for search by identifying site changes and monitoring their impact, diagnosing site issues quickly and communicating them to the team. Sign up for our newsletter below. Stay in the know with what's happening in the search industry.